Beta testing of the XT-CFv2 has uncovered some compatibility and reliability issues that will take time to fix, so in the mean time – and conscious of the long development time already of these boards – I’ve turned my attention to making a simpler, more home-assembler friendly XT-CF derivative. Surface-mount (SMT), especially the 0.5mm pitch components, seem to have put off home-assemblers, and then there’s the need to program the CPLD. Though SMT can’t be avoided because of the CompactFlash header, using SOIC chips but still in the same PCB footprint (and ISA slot bracket), things can be made a lot easier. So the XT-CF-Lite – here it is! Just like the XT-CFv2, it’s a self-contained ISA disk device, functionally like a hard-card, providing solid-state, bootable storage to any PC with an ISA slot – right back to the original IBM PC 5150. This board provides the same basic functionality of the XT-CFv2 – a 32K (accessible) flash-based ROM (with 24KB available for any user purposes), XTIDE Universal BIOS support and the port-based IO transfer mode used by the XT-CFv2 by default. But there are some limitations, because the CPLD on the XT-CFv2 provides a wealth of logic space not present here, so the lite version misses out on BIOS port auto-detection, memory-mapped IO, DMA, slot-8 compatibility, and reduced-wait-state operation for PC/AT and above. 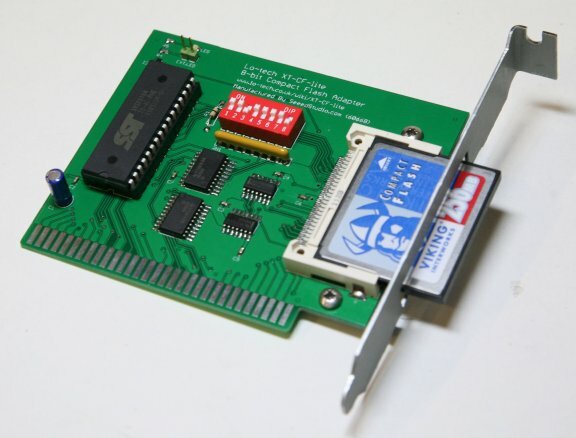 Usually a buffer chip like the 74LS245 would be used between the ISA bus and the media, but I took a chance that one isn’t needed, because the CF card is directly connected (i.e. not cabled) and has 8mA output drive strength. And luckily, it seems to work! That’s SMT – wasn’t is supposed to be easier to make? And of course there’s no CPLD programming to do once it’s assembled. The activity LED and driver IC (IC6) can be left-off if need be. The tiny 0603 package capacitors and resistors remain but are also quite easy. The hardest part is the CF header, but locating points on the header hold it in position whilst it’s soldered, and the trick is to use plenty of flux and flow solder over the pins generously, then use solder wick and more flux to clean up the job. With the official XTIDE Universal BIOS, it will do about 150-180KB/s on a PC/XT. It’s possible to increase this about 20% by switching the BIOS to 16-bit IO cycles, but at the expense of system compatibility. 16-bit port IO is faster because it reduces the instruction count and off-loads some work to the bus interface unit (BIU), but in development of the XT-CFv2 it was found that some clones have errors in BIU logic resulting in byte-swapped data delivery. PCBs and slot brackets are available now via the site Shop. Components can be found at Farnell, Digikey or Mouser. Full board details in the wiki. I would like to purchase the board and bracked. 10 pound si very reasonable. So your not confused, I also requested that my name be added to your list for assembled XT-CFv2 on your XT-CFv2 page. hi, i t hink i’d like to buy one of those already assembled. how easy are they to get to work in a Tandy TL/2 1000, IBM compatible pc that has a 80286 intel processor? please advise. thanks! Hello! The TL is a target platform most definitely, since it only has 8-bit slots. But I’m not able to offer assembled boards (see comments further down). Thanks; I’m not able to offer assembled boards because too much capital is needed for a home-brew hobby. But, I am working on something that is much easier to make and cheaper still – watch this space! Hello, do you have any boards for sale? Hi, the XT-CF-lite project has been taken on by Sergey – see http://www.malinov.com/Home/sergeys-projects/xt-cf-lite. Hope that helps!